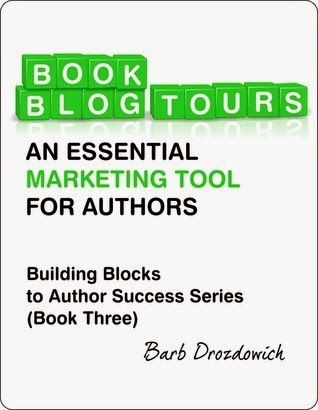 First thing, for newbie authors, this is a good resource. For the more experienced author, you may find bits and pieces of this book helpful, but I think you will already know most of what you read. I'm in the latter category, and as an author, host, AND tour organizer, I agreed with parts, disagreed with others. I liked how the book was set up. It sort of took you through the different steps of a tour, from beginning to end. It talked about REALISTIC EXPECTATIONS, which is something I'm always trying to drive into authors' heads. TOURS DON'T SELL BOOKS. THEY SPARK INTEREST. So I really appreciated that. I thought the suggestions regarding giveaways, doing proper research of tour companies, and setting goals for your tours were all really great pieces of advice. My favorite bit was about how giftcards and big prizes like Kindles are kind of like bribes and don't really pull in readers. A lot of people simply enter to try and win the prize. They don't have any interest in the book(s). That really got me to thinking and helped bring about the change I recently made for Masquerade Tours' giveaways. Like I said, there were a few things that I disagreed with. Like commenting on blogs during your tour. I'm firmly against it, but this book promotes it. I understand why. Because you want to engage readers and network with bloggers. I agree that authors should do this, just not during the tour and certainly not with comments on the actual blog post. There are other ways to network (Twitter, Facebook, Email), and I feel that the comment section should be left alone and free for interested readers to discuss the book being promoted. I also had an issue with the accountability issue discussed in the later part of the book. It says that tour organizers should have a back up plan in place for hosts that do not post. That's all awesome in theory, but what use is a back up blogger? The only thing you will get out of a back up blogger is a promo post, and they probably won't get around to that until the next day, if that. I just don't see the use of back up bloggers and authors should go into tours expecting bloggers to "flake". Happens ALL THE TIME. Overall, this was a short, concise guide to book tours. Besides the few things that I would change, it is a good beginners' source to the book touring business with a bunch of great advice and ideas. Definitely a book worth reading! ✭✭✭✩✩ Only 99¢ on Amazon!